New Wave is a group that incorporates the myriad perspectives of our members to build a radically-welcoming feminist community. This isn’t our grandmothers’ Feminism – we draw on the great progress of previous generations while forging ahead and creating our own path. As a diverse group of Feminists, Womanists, Gender Studies students, professionals, and other folks with an interest in gender equality, we welcome ALL voices, Queer or straight, cis or trans, all genders and all backgrounds. While you’re at Meetup, you might also visit the pages for Boston Pro-choice Supporters and the Boston NOW Chapter. … new writers and editors to pick up the Hoochie Woman brand and put out a new issue. If you are an undergraduate with the desire to commentate on culture from a feminist perspective, please drop us a line. Anti-choice crisis pregnancy centers (CPCs) will do whatever it takes to stop women from accessing abortion. Many CPCs harass, humiliate, and scare women. Now, CPCs are using popular online search directories to mislead women about their services. We need to stop CPCs from using popular sites like SuperPages.com and YellowPages.com to advertise abortion services that they clearly don’t provide. Help protect women from accidentally going to a CPC staffed by anti-choice volunteers, by adding your name to the letter being sent by NARAL Pro-Choice America to SuperPages.com and YellowPages.com. Never heard of a CPC? Many CPCs look like a woman’s health-care clinic. But most are unlicensed and unregulated organizations staffed by anti-choice volunteers. Their number-one goal is to make women feel too guilty or scared to choose abortion by providing information that is medically inaccurate and manipulative. Let’s be clear: CPCs do not provide abortion care. It’s fine for groups that oppose abortion to advertise. But they shouldn’t be allowed to advertise under “abortion services” or “abortion clinics.” It’s just cruel to lie to women facing an unintended pregnancy. Sign the letter. Tell these companies that CPCs are using their resources to trick women, and that the fraud against women must stop. Add your name by June 30 so you can be part of their delivery! You can also sign the petition at Change.org. Thank you to Jackie for pointing out that the deadline for this letter is coming soon. Anti-woman? This is always a surprise, our founders took the title out of a fishing lure catalog, and didn’t have anything anti-woman in mind. Not wanting to be oblivious, however, we of the current writing and editing crew decided to look up the word in the dictionary. Really, now. Voulez-vous get something better to do than accuse us of woman-hating, when obviously we’ve got the best intentions in appropriating and rehabilitating (a great word — meaning, to dress in new clothes!) a term of anti-woman sentiment? We like the long “o” sound, we like the tschuss-tschuss, we think highly of our diminutive and easy-to-rhyme-with -ie ending, and are pretty happy all around being called Hoochies. We won’t be changing the name to anything safer, thank you. Besides, all the good, wholesome, safe names are already taken. Here’s a look at the latest search terms that have brought readers to our blog. 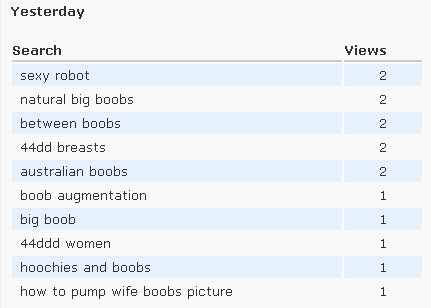 With these numbers, how could Boobie Magazine fail to be a hit? Plus, we can guess, we’d attract attention from just the sort of people who might benefit from a challenging feminist perspective. We here at Hoochie don’t subscribe to the principle of gender-exclusive art experience. Accordingly, we do not support gender-exclusive art competitions which are organized for any reason other than to remedy differential access to art awards. Such unfairness is not uncommon, but it is not universal. The competition held by MsLexia magazine seems to fall outside of this category. In mildly satirical but nonetheless authentic terms we hereby announce the first-ever Hoochie Woman ‘zine Men’s Women’s Poetry Competition. the editors of Hoochie announce their intent to award a $100 prize to the male poet who submits the poem that best represents a woman’s experience from a woman’s point of view. Please make sure you have read the rules before submitting. Entries may be submitted online, by email to hoochiewomanzine@gmail.com. Payment for your entry may be submitted via PayPal; if you do not have a PayPal account, you will find that you are able to submit a credit card payment to hoochiewomanzine@gmail.com using PayPal without signing up. Please add a $1 processing charge to cover administration. If the email account you use for the electronic payment is different from that you use to submit your poems, please make this known to us. Poems may be in any style, of any length, on any subject which addresses woman’s experience or on any subject addressed through a perspective constructed so as to seem like a woman’s. Sequences will be judged as separate poems. Each poem should be typed, on A4 paper, single sided and with pages numbered. Please do not write your name on the same sheet as your poems. The author’s identity will not be known by those judging the poems. Enclose a separate sheet with your name, address, telephone number, email address, plus the title/s of your poem/s. Mark your envelope ‘Men’s Women’s Poetry Competition,’ and mail to 95 Melville Avenue, Boston MA 02124, attn. Zachary Bos. The entry fee of $5 allows you to enter up to three poems. You may enter as many as many times as you like, provided each set of poems is accompanied by the $5 entry fee. Entry fees are payable in dollars American. Entries sent by post can be paid for using PayPal; please include notice of your payment confirmation with your poems. Checks should be made payable to the Boston Poetry Union. Overseas entries may be submitted by post or online. Entries will not be returned; please retain your own copy. If you require acknowledgment of receipt of your entries please list an email address through which we can use to contact you. Winners will be contacted in September 2010 and winning poems will be published in the Winter 2010 issue of Hoochie, as well as on the Hoochie blog. Copyright of each poem remains with the author, but Hoochie has the unrestricted right to publish the winning poems in print and online, as well as retaining unrestricted rights to use the winning poems and any related material for PR purposes. Poems must concern themselves with the female experience, either indirectly through consideration of some subject related to the female (an ode to pregnancy, for example), or directly through creative imagining of some subject or scenario as if by a woman (for example, a female character considers her own pregnancy). Poems should be in English (or English dialect) and should not have been published, self-published or accepted for publication elsewhere, including in online publications. We will accept poems from men of any nationality from any country. You do not have to subscribe to notions of gender difference to be eligible, but you do have to be a man. This competition, while not a hoax, is a direct and nearly-satirical challenge to gender-exclusive writing competitions. Paid associates of the Boston Poetry Union are not eligible to compete. For more information or clarification, contact us at hoochiewomanzine@gmail.com. Closing date: 15 August 2010. Hoochies, I am proudly and unequivocally pro – choice. Unfortunately, the anti-choice movement often terms this position “pro-abortion.” No one is pro – abortion. It is a horrible experience that no woman should have, but we must have the right to choose for ourselves. Much of the abortion debate centers around the actual decision, but what happens afterwards? Many “right-to-life” groups have attacked this question with considerable energy and emotional manipulation techniques. Project Rachel, an online “support center” aligned with evangelical Christianity, tells women that “it’s normal to grieve a pregnancy loss, including the loss of a child by abortion. It can form a hole in one’s heart, a hole so deep that sometimes it seems nothing can fill the emptiness.” At first glance, this seems harmless enough – even kind and understanding. Yet the implication that abortion trauma (and their “data” is pretty questionable) means that a woman shouldn’t be able to decide about a life-changing pregnancy for herself is condescending and ridiculous. The Project Rachel website, cunningly called “Hope After Abortion,” has a section devoted to the stories of women who have regretted their abortions. I am not contesting that a woman might regret her abortion, or feel the agony and confusion of depression and loss. I feel deeply for the women who have shared their experiences on this site. Yet their sad stories do not mean that every woman should lose her freedom to control her own body and life. Furthermore, while Project Rachel recognizes the anguish that can follow abortion, it does nothing but torture women who have already been through enough trouble. One of the quotes sections is ominously entitled “Died,” and is a list of anonymous entries such as: “I wished it was me and not my baby who was dying.” I think it is destructive and cruel for organizations like Project Rachel to manipulate women in the guise of compassion. We must make sure that there remain kinder, more helpful options that emphasize truth and understanding instead of thinly veiled judgment and deceit. P.S. I just Googled “post abortion support” and almost everything that came up was in the vein of Project Rachel. Let’s change this. I’m a Feminist. That’s right, I said it. – I believe wholeheartedly in a woman’s right to choose. I also know that having an abortion is a horrible experience, but if a woman does not want to have a child, she should not have to have a child. For me, the issue is ultimately that simple. – I think “man-bashing” is completely destructive and inhibiting. Men can be (and are) feminists, too. We can’t leave them out of the fold. – I’ll admit it. I don’t like my body a lot of the time. But it’s so BORING to constantly have the “I’m fat” conversation. As women, we have better things to talk about, and more important things to do than obsessively pick apart our bodies. – Finally, I believe that young men and women need to take back feminism. We support women’s issues AND we are feminists! In her review of Natasha Walter’s new book on British sexism, Living Dolls, Katy Evans takes us from early 20thcentury Elizabeth Dalloway – feeling liberated in fawn-colored coat on a London bus – to the hypersexuality of modern Britain and “The New Sexism” of surgically enhanced glamour models, pole-dancing, and a Babes-on-the-Bed competition. More on Living Dolls can be found at The Guardian.